In August 2015, I hiked the West Coast Trail. It proved to be a traumatic and psychologically intense week, but one that I wouldn’t trade for anything. I am immensely proud of my accomplishment, am a stronger and more knowledgeable backpacker, and cherish the memories I made with my team throughout this challenge. I remember so many times along the trail muttering under my breath whos stupid idea was this?! (mine, btw), or I hate hiking. I hate being outside. I will never do this again! But, not long after returning home, having a hot shower, a bowl of pho, and a good night sleep, and I’m ready to do it all over again. My party included myself (32 years old, carrying a 47 pound pack), my brother (38 years old carrying a 52 pound pack), and a dear family friend - who is actually the midwife who delivered me in Bella Coola! (62 years old, carrying a 42 pound pack). All bags were meticulously weighed and packed to fall within the recommended 25-30% ratio to body weight. We hiked the trail North to South (it can be hiked either way), and we completed it in 7 days and 6 nights. At the beginning of the trail you will be given a map and a tide chart. It is important to know how to read this as this will become your schedule and life for the next week. The trail often splits where sometimes you must take the forest, other times you must take the beach, and other times you can choose, depending on the tides, I suggest, whenever possible, that you take the beach. The terrain is much easier, less slippery (when there are heavy rains) and it is absolutely stunning! There are sea caves to explore, a little waterfall, and usually whales and sea lions to watch. Taking this route requires dedication and planning however. In our case, with the tides, it meant that we were up before 6am each day to make it through certain passes before the tides came up too high. We packed up every morning in the dark, but were rewarded with tidal pool treasures and unspeakable ocean beauty. There were some groups who stayed up late and slept in, and consequently were forced to take the inland route, or took the beach but didn't make it in time and had to hike through waist deep ocean with their packs on their heads. Coming from the lower mainland we are not necessarily familiar with this concept. We know to hike during daylight but the tides add another factor to consider. I was fortunate that this was my brother's 3rd trip and he took care of the route planning. If this is your first time, make sure you understand how to read these charts. After a summer of record breaking heat and drought, we were concerned that we may not be able to access the trail because of extreme forest fires in the area. We booked these dates 13 months in advance and it took a tremendous amount of planning so would not be easily rebooked. Thankfully, the rains came a few days before we began and the roads reopened to allow access the trailhead. We were told to expect continued rains for the next day or so and then it should clear up. With that in mind, we began the trail on Sunday, August 30th with sporadic showers throughout the day (which anyone be prepared for and in fact expect). What we didn’t know was that those rains were just the beginning. The following day the rains increased to a degree that I have never experienced before. It was torrential and relentless. We would exit the trail a week later to learn that two major storm systems collided right above us and that it came to be known as the “storm of the decade”. A river that we waded below our ankles was over waist deep only 5 hours later and swept several members of parties down the river to sea. These hikers were eventually evacuated due to hypothermia. The trail closed behind us for a couple of days. What is normally a lush, green, and breath taking west coast trail, was dark, miserable, slippery, and muddy. Oh, you cannot imagine the mud! The first day or two you try to walk around the puddles or step on roots, but you soon realize you are going to get dirty anyway and you just stop fighting it. At one point I was in the front and charged on through a puddle to have my leg sucked up to my thigh in mud and I had been moving so fast that before I knew what was happening my other leg followed. With the thickness of the mud and the weight of my pack I needed a lot of help to get out. You can’t get upset about these things but just laugh at yourself and how crazy it all is. This is a storm that was so extreme that it washed a dead humpback whale onto shore! The closure would contribute to why we only saw a small handful of other hikers along the trail. The last night at Thrasher Cove was also the first night on the trail for those starting from the south end. We were excited about leaving the next day and they were excited about their first day on the trail. The sun was out finally, and we took all our clothes off and swam for the first time in the ocean without extreme threat of hypothermia. That evening we sat around our campfire and were joined by many different hiking groups of all ages and from different places, all hiking for different reasons. This, I’m told, is what the WCT is usually like. Sun, friends, beautiful scenery, happiness, sharing stories – not huddled in a cave shivering in the darkness. We had hoped to actually time it right and be able to hike straight out from our previous night’s camp, but with a ferry waiting for us at the very end to cross the final river, we didn’t quite make the timing and were forced to make one more camp and leave the next day. I was so disappointed, but looking back on it I’m SO thankful to have gotten a glimpse at that – what it could be, and what it will likely be the next time I do it. It’s hard to put a finger on exactly what made this trip so intense, since the trail itself was not near the most difficult trail I’ve hiked. I guess it was the combination of the weight of the pack (which sounds manageable until you pick that massive pack up and realize you have to carry it up and down over 70 ladders and over 75 kilometers), the length of time disconnected from my family and my little boy at home, and the compounded exhaustion of packing up and going through the same routine each day for a week in rain that does not stop. For these reasons, I found this week to be significantly more psychologically than physically demanding. When we finished the trail and crossed the final ferry to reach the Park Ranger’s office and entered to hand in our permits (they track these to ensure each hiker makes it off the trail safely), the officer looked very concerned and kept asking if we needed anything. We were smiling and laughing and she couldn’t believe it. She said that someone had just finished the hike an hour before us and was so shaken up by it that he needed to sit alone in the corner for a while before he could even talk. We contribute our injury-free, (mostly) enjoyable completion of the trail to preparation and quality of gear, choosing a competent and contributing team, and preparing our attitudes for any conditions we would hit along the way. If you hike this trail, you will likely not get the weather we had – but you may! Or only some of it may rain, or it may be have tones of bugs, or be hot! You just can’t predict it, especially when you have to reserve your date so much in advance. Body, mind, and spirit, be prepared for anything! During this trip I slept in a cave with bats one night to seek a short reprieve from the rain, and another night on the beach directly under a thunder and lightning storm so powerful it shook the tent. I climbed ladders that I thought would never end, and pulled myself in cable cars across wide rivers. I fell face first into puddles of mud, and walked head first into a log that knocked me right on my back. I looked forward to hot instant potatoes each day, and slept spooned by Betty each night. I swam naked in the ocean and stopped countless times to watch whales and sea lions swim right off the shore. I was so wet and cold that I have lost permanent feeling in one of my toes, and I was quite convinced that I would have to shave my head because my hair was so extensively matted. I felt a sense of accomplishment with each passing kilometer marker (and cursed at the ones I am sure were spread way too far apart!) I smiled as I soaked in the sun on the last day, and felt happy about saving an injured crab from a hungry seagull J I fell asleep to the sound of the ocean every night for a week. What I would give to do it all over again. Friday Aug 28 – After work take ferry and stay in Sooke. Meet with final member of our team and sort, pack and weigh bags. Saturday Aug 29 – Drive to Port Renfrew and drop off my car, continue to north end of trail (Pachena Bay) and camp there (do orientation at 2PM) *Must book campsite ahead of time to ensure spot. The first one of the morning isn’t until 9 or 10am and you can’t start until that’s complete so getting it done the day before means you can start the trail whenever you want to the next day. Saturday Sept 5 – Hike out in the morning (final 6km) and head home. You are ready for an incredible adventure! At least 3 pairs of smart wool socks. Then one pair of wool socks for sleeping in as well (never to leave tent). If there is any forecast of rain, bring one for each day. $100 cash for food as there is a place to buy either a salmon steak or crab at Nitnat ferry for $25 and then Che Moniques further along the trail with $25 burgers plus drinks and coffee and snacks. You think that’s a lot of money now, but on the trail it’s well worth it! Light weight hiking poles (with lever locks rather than twist locks) – remove baskets first or you will lose them in the mud! Well stocked First Aid Kit with butterfly bandages, polysporin, bandaids, moleskin, etc. A container of various medicine: Antihistamines, T3s, Advil, Gravol, Ativan, Imodium, sleeping pills, etc. (and whatever else you may need). You never know what you’ll need! Perhaps the most important thing that we did was keep a pair of clothes and socks clean and dry to sleep in. They were our in-tent clothes and under no circumstances were they allowed out of the tent. Everything else we wore was drenched and it was tempting each day to come into camp and want to put on dry clothes, but once your sleeping clothes and sleeping bag are wet, you are done. You are not able to warm up and sleep and will become too weak to continue. Our sleeping bags were only opened and set up in the tent and they were packed up again in the tent. We would strip off our wet clothes outside the tent and would store our dry clothes inside our sleeping bags so there is no chance that the bag or clothes would get wet. It was a challenge each morning when I would have to get back into freezing cold, soaking wet socks and underwear and then throw on my heavy pack, but each day that I got into camp and was able to sleep in dry clothes I was thankful. We used 880ml White Gas (one large bottle full) – We carried an additional 600ml in another two small bottles just to be safe with accidental spills. We brought platypus hyrdopacks but found surprisingly that regular water bottles were much easier to use. First, the mouth piece of my hydropack fell in the sand on the first day and without proper soap and washing, I could not get it clean. In addition, I had to take everything out of my backpack each time to have access to refill my hydropack. We only used them for the first day and then switched exclusively to our 1L water bottles. We preferred the water purification method of chemical tabs, though each method has its merits and you need to decide what you want to use. We liked the simplicity of the tabs. One tab/pill for 1L water bottle. Shake, and let it sit for half an hour. It is much easier than mixing iodine chemicals and adding to water. However, with the pills, there is a strong chemical taste. We brought power aid to add to the water to give us strength but also mask the taste. It worked, but after a week I so longed for just a plain glass of water. Don’t bother bringing the LifeStraw – you will need too much water along the way to make it worth it. You need a quick and easy method to purify several liters each day. It is very important that you test ALL equipment before packing. A week is a long time to go if you cannot use a stove or a tent for example. Even though my brother and I keep both our camping gear inventories in immaculate condition, we still found a couple of small things to replace. In optimum weather conditions, wool hiking socks can be washed in the streams and laid to dry in the sun each day. In our case, with extreme rain, our gear did not get a chance to dry out and we wore soaking wet clothes every day. Bring extra socks if you can’t guarantee no rain. It is incredibly important to have fire while on an isolated trail for so long. It was unbelievable how many groups were so unprepared in this regard. Some only brought a package of matches and in the torrential rains they got wet and were useless. One brought only one lighter and then lost it. And still others had the gear but didn’t know how to use it. Our team brought 2 lighters, water proof matches, Vaseline and cotton balls, flint and steel, SOL fire starter packs, a knife to break down cedar driftwood for curls and kindling, and a knowledge of how to do it all. I cannot stress how important this is! Our team became known on the trail as the “go to” group who had all of the gear and knowledge and we were shocked at how many groups came to us for help. On beaches where all the wood was soaking wet and it continued to rain, we were the only ones who had a fire. Learn how to do this and come prepared. 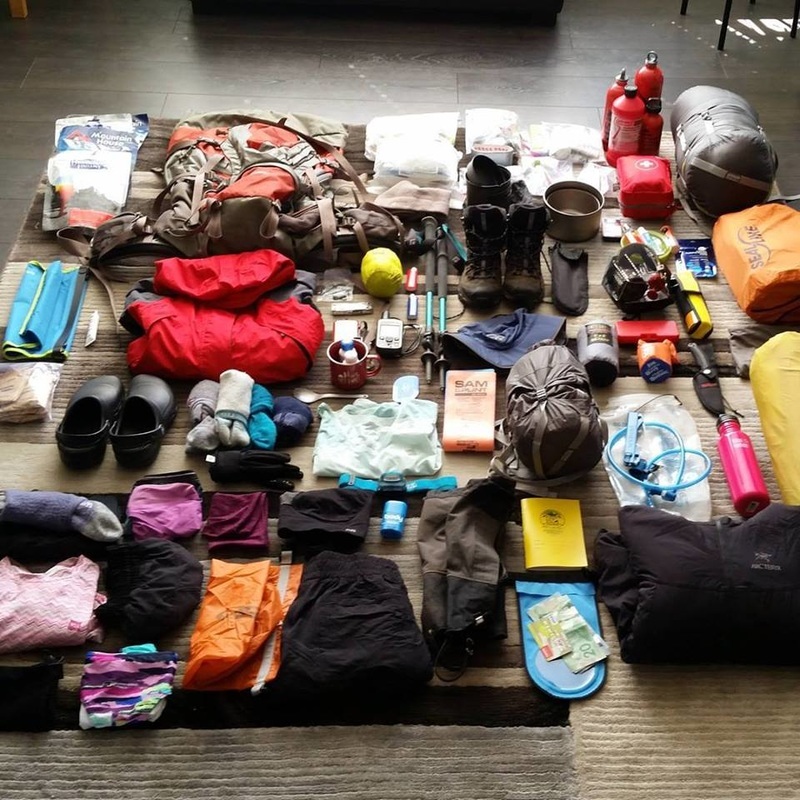 If you plan on borrowing gear, try it out first under the conditions you would use it for the trail (ie, if you borrow a pack, put 45 pounds in it and go for a long hike). Some gear likes stoves or sleeping pads are fairly universal, but boots, clothing, and packs are very important to ensure that they fit you perfectly. 6 Lunches: 1 powerbar (or 1 instant noodles alternated each day), plus 2 granola bars and 1 fruit bar each. 7 Dinner (for 3 people): 2 freeze dried meals packets, 1 packet of instant Idahoan potatoes (needs margarine and milk powder). We took pictures each day of our meals with a thumbs up, side, or down, to indicate if we liked it so we could remember for next time which meals to take and which to skip. In an effort to keep this shorter, I have not included it here, but please feel free to email me for this list.